Over the last few years, IBM® IMS™ and IMS tools have been modernizing the interfaces to IMS and the IMS tools to bring them more in line with the current interface designs. As the mainframe software products are becoming more integrated with the Windows and mobile environments, a common approach to interfaces is becoming more relevant. The traditional 3270 interface with ISPF as the main interface is no longer the only way to do some of these processes. There is also a need to provide more of a common looking interface so the tools do not have a product-specific interface. This allows more cross product integration. Eclipse and web-based interfaces being used in a development environment, tooling using those environments provides productivity improvements in that the interfaces are common and familiar. 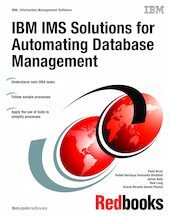 IMS and IMS tools developers are making use of those environments to provide tooling that will perform some of the standard DBA functions. This book will take some selected processes and show how this new tooling can be used. This will provide some productivity improvements and also provide a more familiar environment for new generations DBAs. Some of the functions normally done by DBA or console operators can now be done in this eclipse-based environment by the application developers. This means that the need to request these services from others can be eliminated.